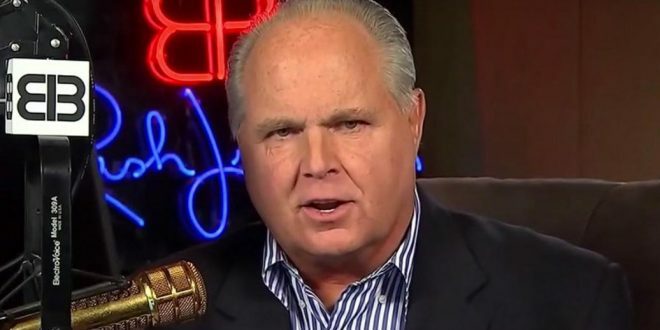 Rush Limbaugh: Leftist Weathermen Are Using Florence Warnings To Brainwash People About Climate Change - Joe.My.God. “This is made to order for the climate change, global warming crowd. This is, they tell us, one of the most powerful hurricanes this far north, ever. And, of course, why is that? Well, that would be sea surface temperature. And why is that warmer than, there you go, climate change. It’s being accepted as a non-argumentative fact. I don’t care what meteorologist you watch or read, website or what have you. All of this seems to be acknowledged fact. So we’re keeping an eye on that. “Hurricanes and hurricane forecasting is like much else that the left has gotten its hands on, and they politicize these things. For those of you asking, ‘What’s the politics of a hurricane?’ Climate change is the politics of a hurricane. The forecast and the destruction potential doom and gloom is all to heighten the belief in climate change.” – Rush Limbaugh, who said the same thing last year before fleeing his home as “liberal hoax” Hurricane Irma approached.